From an early age, Mark Anderson loved to draw and tell jokes. He persuaded his teachers to let him do his homework as cartoons. When they said no, he drew in the margins. Mark took a cartooning class at a local library and got to rub shoulders with a working cartoonist. When his high school art teacher saw his cartoons he told Mark to go to the school newspaper office and introduce himself as the new cartoonist. He did just that. Mark drew for his high school and college newspapers; he graduated from the University of Northern Iowa with a music degree. He moved to Chicago, married his college sweetheart, and found a job in a screw factory. Bored, he drew cartoons at his coffee table in his spare time. He submitted his work to magazines. To his surprise, they started buying. Mark kept writing and drawing cartoons early in the morning, on his lunch hour, and late at night. 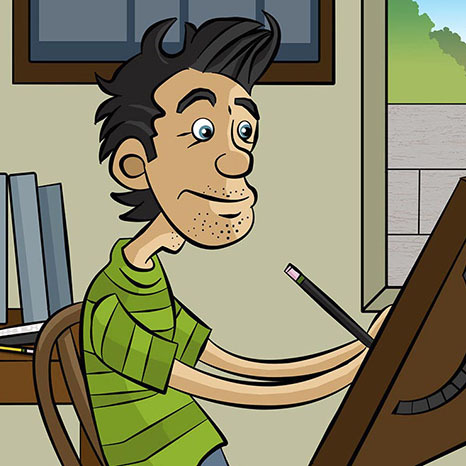 After their first child was born, he quit his job to be a stay-at-home dad and draw cartoons full time. Mark Anderson has the best job in the world - professional cartoonist. He runs Andertoons.com and teaches cartooning at schools and libraries. He lives in the Chicago area with his wife and children who look at his drawings and laugh at his jokes. Mark is a member of the National Cartoonists Society and has been a featured speaker at their annual Reuben Awards. He has also spoken at the Kenosha Festival of Cartooning, taught at two Success in Comics seminars, and written for the International Journal of Comic Art. Mark even has a cartoon displayed in the Smithsonian Museum of American History. He is syndicated online by Universal.